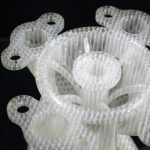 Stereolithography technology, commonly known as SLA, utilizes the additive manufacturing process of vat photopolymerization. 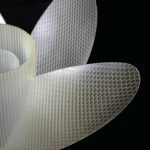 This printing process uses a UV laser that traces the design, curing and solidifying the polymer. 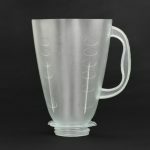 SLA offers highly accurate and detail parts with extremely fast printing speeds. Pre-Processing: The 3D CAD model of a part or component is oriented, sliced and posited using special control software. 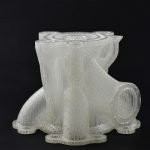 This software translates the 3D data into two dimensional layers corresponding to the part geometry while also adding any support structures needed to successfully print the model. 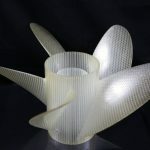 Production: The SLA process uses UV lasers to trace and solidify a single later of photopolymer in a specific geometry. Once a later is complete the build platform lowers at a precise distance, the aqueous photopolymer is then spread across the platform and the process is repeated until the model is complete. 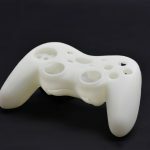 Post-Processing: Once the print is completed, the part will still require post processing to achieve the final geometry of the part. 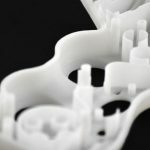 SLA parts require the manual removal of supporting structures as once they are taken off the build platform. 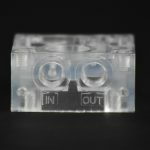 SLA parts may also require an Isopropyl alcohol bath and secondary UV light curing to finish the part.